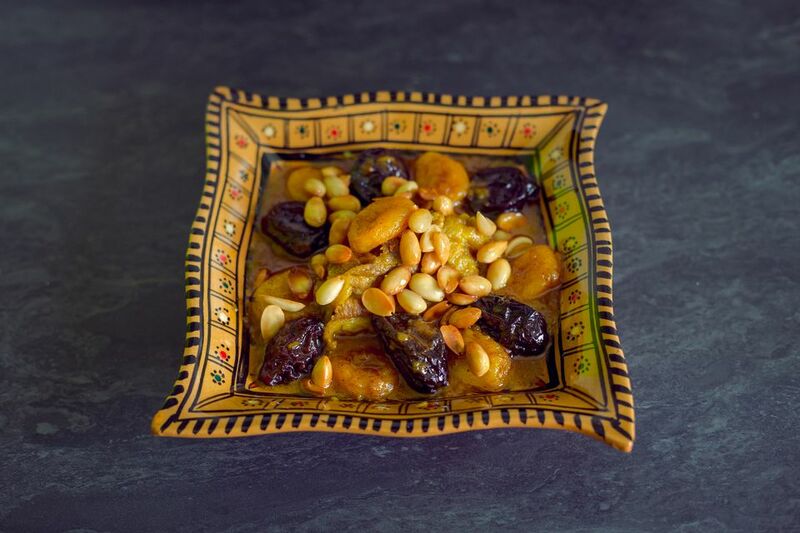 Beef or lamb with prunes is a classic sweet and savory Moroccan dish that combines dried prunes and meat with the fragrant spices of ginger, saffron, cinnamon, and pepper. It's popular as a traditional offering at holiday gatherings, weddings, and other special occasions. Of course, no special occasion is needed in order for a tagine of lamb with prunes to appear on the table. Prep work is minimal, making it a perfect choice for casual family meals. Although the use of a Moroccan clay or ceramic tagine is most traditional, most Moroccan cooks prepare this dish in a pressure cooker as it speeds things up. Tender cuts of meat (some pieces on the bone) will give the best results. The cooking time listed below is for the pressure cooker method. Double or triple this time if using a conventional pot or tagine. Note that the onion preparation is different for the tagine method. In a bowl, mix the meat with the onions, garlic, and spices. Heat the oil and butter in a skillet over medium heat and brown the meat for a few minutes until a crust forms. If using a pressure cooker, place the meat mixture in the pressure cooker and add 2 1/2 cups of water and the cilantro. Over high heat, bring the meat and liquids to a simmer. Cover tightly and continue heating until pressure is achieved. Reduce the heat to medium, and cook with pressure for 45 to 50 minutes. (Note: About halfway through cooking, remove 1/2 cup of the liquid and reserve.) After the meat has cooked, release the pressure and reduce the sauce, uncovered, until it is mostly oil and onion. If using a conventional pot, add the meat mixture to the pot along with the 2 1/2 cups water and cilantro. Cover and simmer the meat over medium heat for 2 to 2 1/2 hours, until the meat is very tender and breaks away easily from the bone. (Note: About halfway through cooking, remove 1/2 cup of the liquid and reserve.) If necessary, add a small amount of water during cooking to prevent the meat from scorching. When the meat has cooked, reduce the sauce until it is mostly oil and onions. Mix the meat with the grated onion, garlic, oil, butter and spices, and place on the sliced onion. Add 2 1/2 cups water, cover, and place the tagine on a diffuser over medium heat. Allow the tagine to reach a simmer (this may take a long time), and then reduce the heat to the lowest temperature necessary to maintain the simmer. Drain the prunes, then add the 1/2 cup of reserved liquid from the meat. Stir in the honey, and cinnamon, and simmer the prunes for another 5 to 10 minutes, or until they are sitting in a thick syrup. Arrange the meat on a large serving platter and spoon the prunes and syrup on top. If you've cooked in a tagine, it doubles as a serving dish. If desired, garnish with sesame seeds and/or fried almonds. Moroccan tradition is to gather around the table and eat from this communal plate, using Moroccan bread to scoop up the meat and sauce.